Vacation rental house. 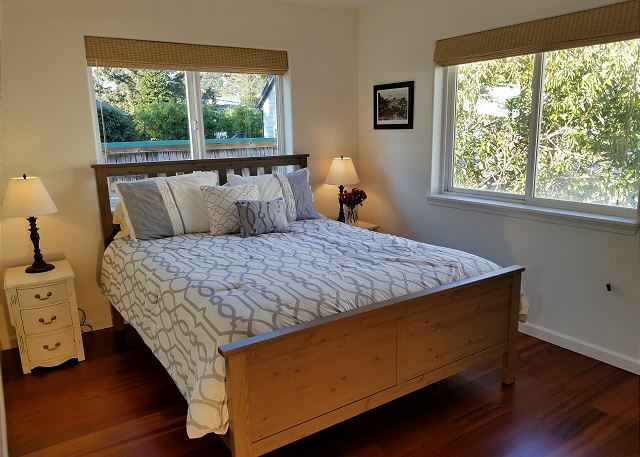 Sleeps 12, 4 bedrooms, 2 bathrooms. Dogs allowed. 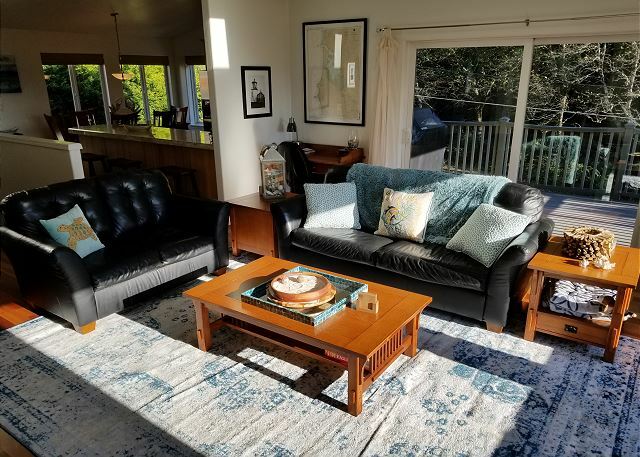 Just 1 block from the beach, this beautifully built home will become your new favorite place to stay when coming to explore the Oregon Coast! This is a truly immaculate and well planned beach home that is infused with natural light from the many windows and skylights. There are vaulted ceilings for a spacious feel, gorgeous Brazilian Cherry Floors, and the well equipped kitchen with hickory cabinets and granite counter tops is going to be a great place to gather with family and friends while preparing your meals. 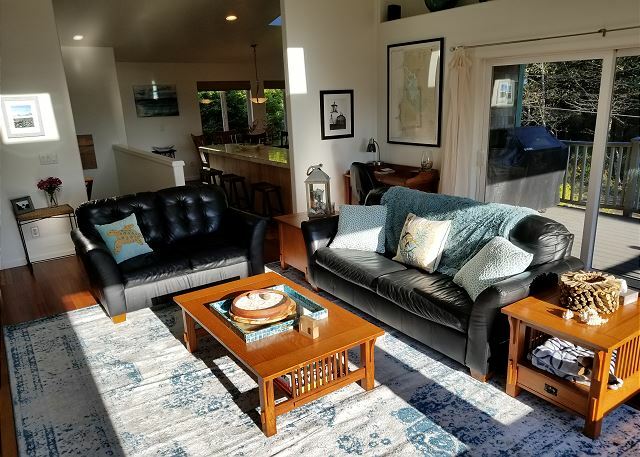 The upper floor has a spacious living room that opens up to a deck where you can enjoy your morning cup of coffee while listening to the sounds of the ocean. There are 2 bedrooms upstairs: Both with Queen size beds. 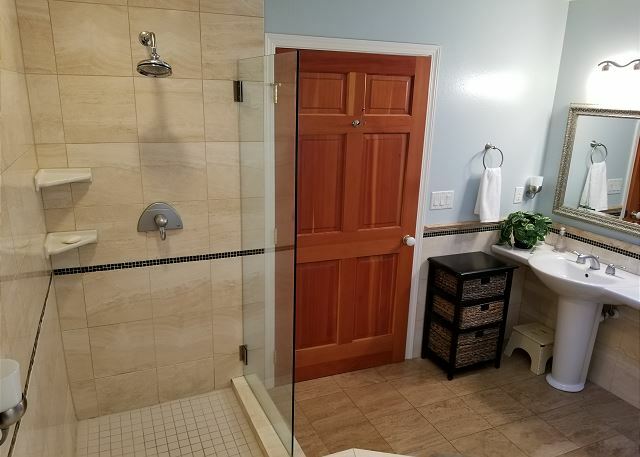 There is a full bathroom in the hallway in between the 2 rooms. 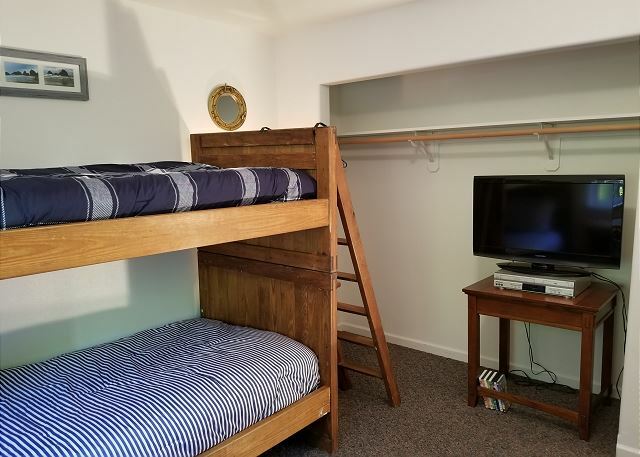 There are 2 bedrooms downstairs: One with 2 sets of bunk beds and the other room has a queen bed and 2 day beds along with a full bathroom. 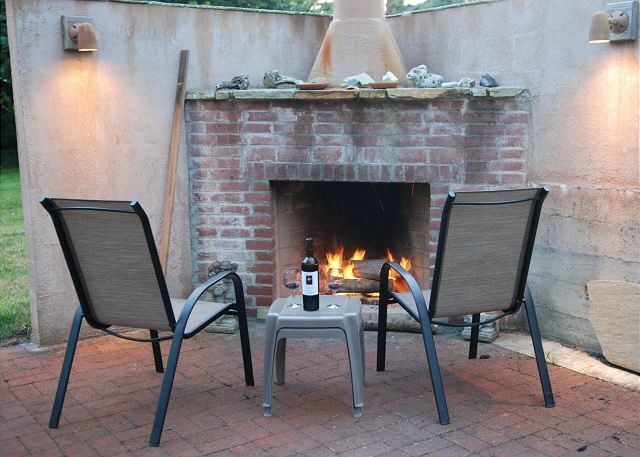 There is an outdoor brick patio with fireplace that is a perfect place to relax at the end of the day with a glass of wine or to make S'mores with kids after getting back from playing on the beach. The Oceanside community is built up on the hillside so all around the community you will have amazing ocean views and a feeling you just don't get from other coastal communities. At the northern-most end of Oceanside beach, is a tunnel through Maxwell Point. During low tides, the tunnel gives you access to Tunnel Beach on the other side. Around the next point at the North end of Tunnel Beach, is Agate Beach, which can only be reached by going around the point on a minus tide and lives up to its name as a great place to search for Agates. There are 3 great restaurants just 2 blocks from the house that have delicious food and drinks. Roseanna's Cafe, Blue Agate Cafe, and Brewin' in the Wind. 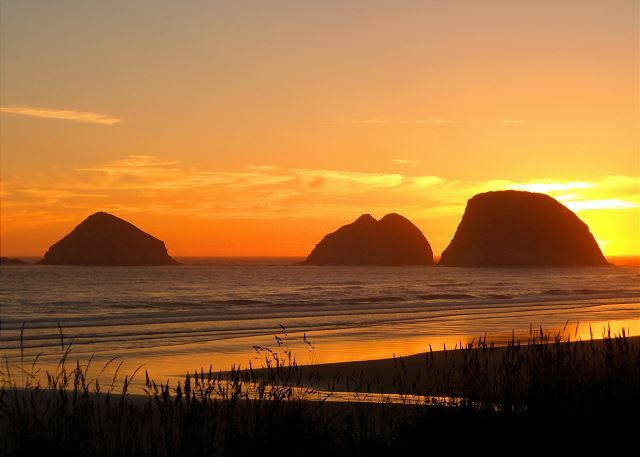 The Cape Meares lighthouse is 5 minutes North which offers stunning views of the coast. It also has over three miles of hiking trails and a mile-long walking trail that winds through old-growth spruce trees, including the uniquely-shaped "Octopus Tree". A short quarter mile hike from a turn-off at the park entrance will bring you to the largest Sitka spruce tree in the state of Oregon. In winter and spring, this park is an excellent location for viewing whale migrations. During the summer, resident whales can be seen from Cape Meares along with seals and sea lions that are often seen and heard. Just 5 minutes South of Oceanside is Netarts Bay which has some of the best clamming and crabbing on the whole Northern coast... There is so much to do and see and this area! 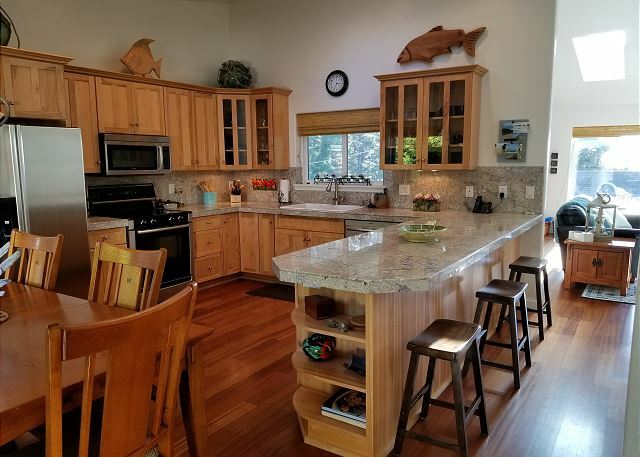 Whether you stick to hanging out and socializing at the house, go hiking on the nearby trails, or decide to enjoy the long stretch of sandy beach, this will truly be a wonderful retreat! The house was perfect for our family of 7 plus dog! Easy walk to beach. Kitchen well equipped for cooking. Clean on arrival - management very responsive and helpful. Definitely recommend! It was a fun weekend away. There’s no clear view of the ocean but you can hear it and see a little bit. The deck faces the road unfortunately. Easy jaunt to downtown and beach access. Set up was nice where kids could be downstairs and in the garage playing while adults relaxed upstairs. We had a great time and sunny weather. The coffee shop downstairs was supposed to be open Sunday but it wasn’t March 10 unless it opened later. We had a wonderful weekend at the beach, while the weather was raining we were able to play pingpong and foosball. The open livingroom and kitchen made it easy to be able to goof around and still be part of the group while preparing meals. The patio area where the outdoor fireplace is small and not enclosed but adequate. What a fabulous home! 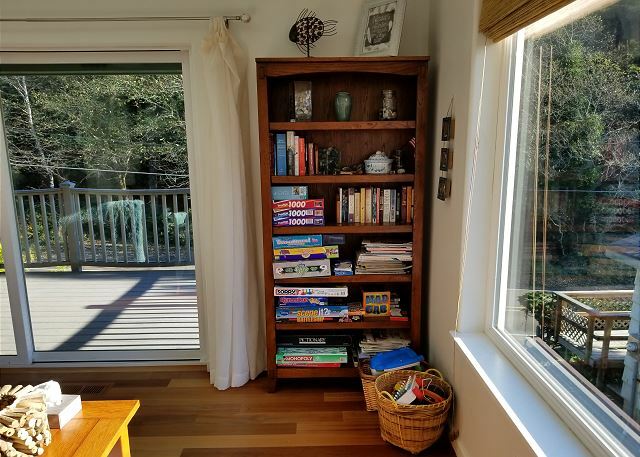 Very clean, lots of space and steps to the beach! What else could you ask for? Already planning our trip back! Very clean and well maintained. Close enough that my small children and I could walk to the beach. A wonderful spot for exploring the Oregon coast. This beautiful place was exactly as described. The play room was a plus for our little ones! We had a really good time. The house was amazing. It had everything we needed. Very family friendly. I will definitely go back. This is an amazing oceanside vacation house. We have stayed there going on 5 years. Easy walk to the beach. Home has every modern convenience you could want, so all you need to bring is your suitcase....and enjoy. Manager, Monica and her assistant Sarah are extremely helpful. Were already booked for 2019. This place was perfect for our stay. We had 6 kids ranging ages from 1-10 years old. 4 adults. You can easily walk to the beach which we tried once (10 min). After that we drove as its a bit easier with young kids (1 min). The house was much better than the photos or description suggests. We were pleasantly surprised. Our only issue with the house was the digital thermostat which was set to turn the heat off at night so we woke up chilly. Our host is looking into resolve the issue for future visitors. Thank you Monica and Sarah for your prompt responses to ansy questions we had about the rental before and during our stay. We would come back! We spent 5 days at The Cape House celebrating with family for my 40th birthday. The house was amazing! There was nothing that we needed. The kitchen is a true chefs kitchen with all the gadgets that you could possibly need. There were 12 of us and the house was perfect and comfortable for all of us and our dogs too. The walk to the beach was easy, even for our older guests. We had the best weather. Couldn't have asked for anything better. We had 5 wonderful days in Oceanside. The house was very comfortable and just as described. 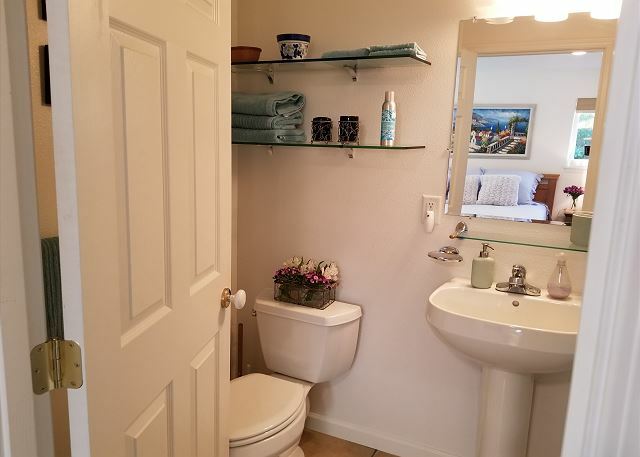 Clean, well equipped and very close to the beach. We enjoyed gorgeous sunsets every evening. The weather was amazing. We forgot it was February. We asked for early arrival and received a text from Monica letting us know when the house was ready for us. Thank you for that. I would definitely recommend this house. If you go to Oceanside stop by Happy Camp in Netarts. The beach is lovely and it's so peaceful. A great place to sit and watch the birds in the bay and see the ocean in the distance. The little store in Netarts has essentials if you need them. We stayed with our family and my sister and parent for a weekend. Very nice house with everything you need. You can walk to the beach and town. 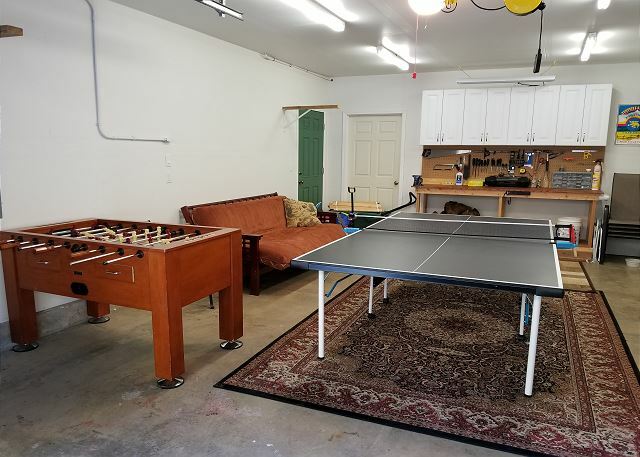 Unlike most of the rental property, this house provides you with enough supplies and good quality. We had a very nice time. The home was perfect for 5 adults and 4 kids. It was clean, well stocked and a short walk from the beach. We would stay there again! Our weekend at cape house was a special time for us , to be together as a family before our son and his fiancé returned to Korea for 2 years. We found the house perfectly cleaned,perfectly maintained with all the room we needed. We especially loved the big kitchen, as we love to cook together.The location was perfect, just enough walk to the beach. Thanks also for the games and children's toys. It really was quite perfect for our family. three couples and two infants. 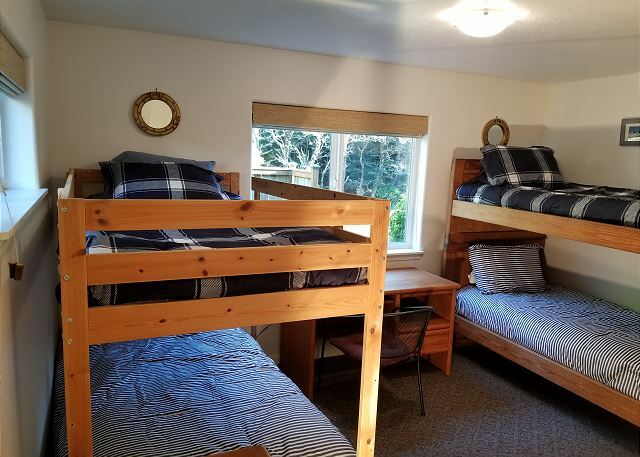 the lower bedroom was very large with a bunk bed, queen bed and en suite bathroom, and an adjacent bedroom across the hall. This was perfect for the couple with children who could have privacy and quiet away from the other vacationers. the kitchen is very well-appointed with wonderful cutlery, crockpot, popcorn maker and lots of pots and pans. No shortage of cookware. The unit was extremely clean. would recommend this unit to anyone with children. The only drawback is some stairs to the main floor which would present a problem to a disabled or elderly person. Our family lives all over the US and because of schedules we are unable to get together for a summer vacation very often. The last time was 3 years ago. So we value our time. The Cape House was a beautiful place to stay and with 9 of us, we never felt like we were on top of each other but yet when we played card games or ate together there was plenty of space. 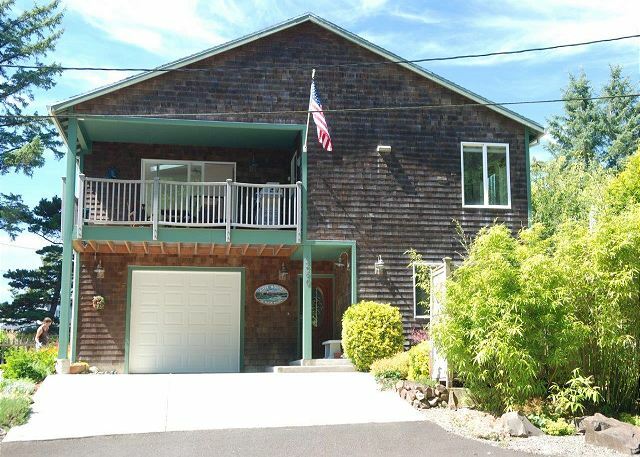 The house was clean and had lots of amenities and was just a short walk to beach access. There was a tiny view of the ocean but we were okay with that. Monica was very available but we only needed to contact her once during our stay when we had a bit of trouble with the internet. The problem was quickly resolved. We love Oceanside because it's not as "touristy" as other places but yet if you want to get a great cup of coffee or eat a fine meal, there are nice places to do so. The beach is a very nice beach, not as crowded as other places, with a cool cave to explore! I would highly recommend the Shore Thing and The Cape House. Home was everything we could ask for. Plenty of beds, nice living area. We didn't use the kitchen much, but it has a great table for playing cards. This home was used as one of the accommodations for Corporate State Retreat. 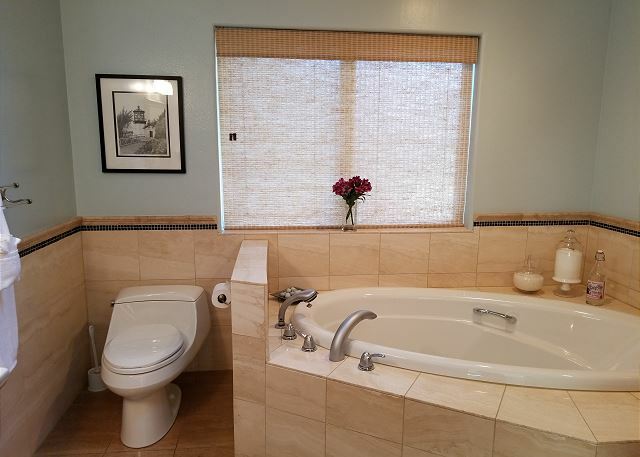 The location in the heart of Oceanside was delightful and the home was is good condition. The house was great and had more than enough room for six adults and two children. The kitchen was well-stocked and had everything we needed to prepare all of our meals. 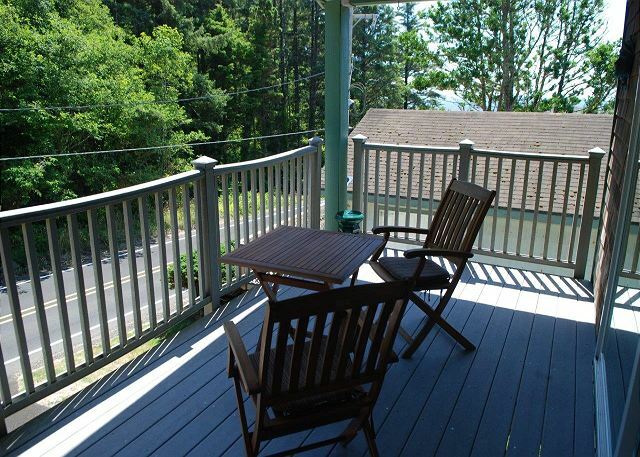 It was also in an ideal location...very close to the beach, and on the same road as the Cape Meares Lighthouse. This home was absolutely beautiful. The kitchen was very well stocked. Walking distance to one of the most beautiful beaches! Toys for the grandchildren and herbs in the garden. Just delightful! This home spares no detail. The cooks kitchen a dream! They also provide sand buckets, wagon and toys for kids. The home is tastefully decorated and was absolutely perfect. We loved the ability to park in a garage. Located close to the beach. The property manager was a pleasure to communicate with. Can't wait to return. This house has everything! What a fun kitchen to create in. This house provided us all with enough space to hang out together and to also take personal space and time. 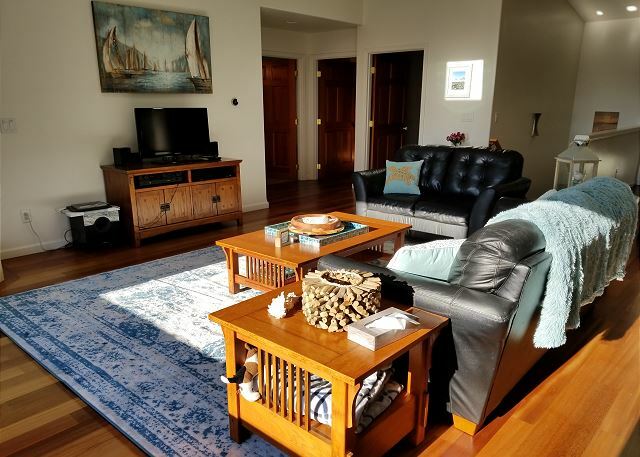 Nice location with a quick walk to the beach and quick drive to the capes. Monica was also very friendly and available when needed. We loved staying at The Cape House! It was beautiful, comfortable and came with surprisingly great views. So much space for our large crew to spread out and very close to everything we wanted to do. Thanks again! The house was lovely and comfortable. There was plenty of room for 6 adults. All our needs were met. I am amazed of the concern and preparedness of the owners for their guest's safety and health. Grab and go bags, raincoats etc all for our use should we need it. I have never seen this before. Thank you! Only issue for us was no cell service which posed a problem because one couple got lost coming to the house. Great home.. great value... great vacation! We met with family from MT for a quick 3-day stay. 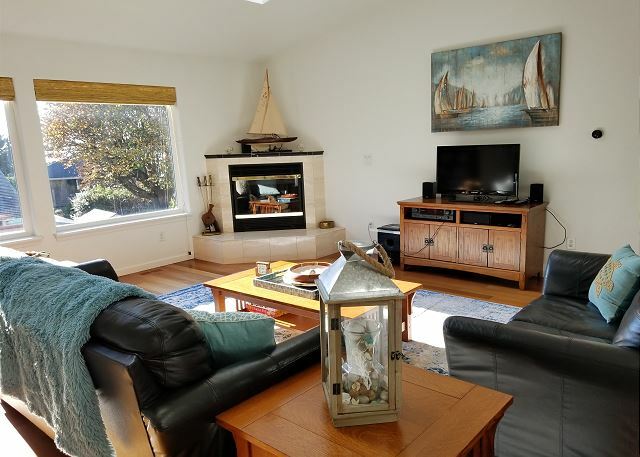 Incredible home - clean, roomy and a walk to the beach. Kitchen was amazing - they had everything you could ever need.... and a herb garden outside! Great movie, book and game selection. Highly recommend this home for a quiet getaway. Great place. The house was much nicer than expected and it had everything you could ever need and more. I wish I had more time to spend there. We used this home for a staff retreat and it was perfect! We enjoyed the stay in this well kept, clean home with a well functioning and stocked kitchen. With a family that likes to eat at home, this was a big plus. There was plenty of room for sleeping and visiting. Toys and games for the youngsters. To get to the beach, you had to walk along the street which was difficult with little ones. We really enjoyed our stay and had everything we needed. The house was clean and inviting. The only thing missing was a view of the ocean from the house, but it was only a short walk away. We were able to have a fire in the beach and the area was beautiful! Our family: 6 adults (2 married couples and 2 single women) had a great week staying in Cape House. The house is beautiful. The manager, Monica, could not be better! When we had an issue with the fridge, she came as soon as she could. The house isn't typical for Oceanside, there isn't a great ocean view. It is a walk to the beach; about a quarter of a mile one direction about just over a tenth the other. There isn't cable or satellite television, so bring a lot of DVD's. There is a Ruko. The seating was good, for 5. As we were six, someone ended up on the floor on in a kitchen chair. The deck is very nice and we really enjoyed the gas grill. The kitchen was wonderful and had everything we needed. As we were all adults, it would have been nice to have 4 real beds, instead of a futon. I was aware that it was a futon before I rented this home, however. Everything taken into consideration, this was a great place to spend a week. We had a great stay at the Cape House. We shared the house with other families and made great use of the shared space and kitchen.